A shoulder dislocation is an injury that occurs with the ball comes out of the ball-and-socket shoulder joint. 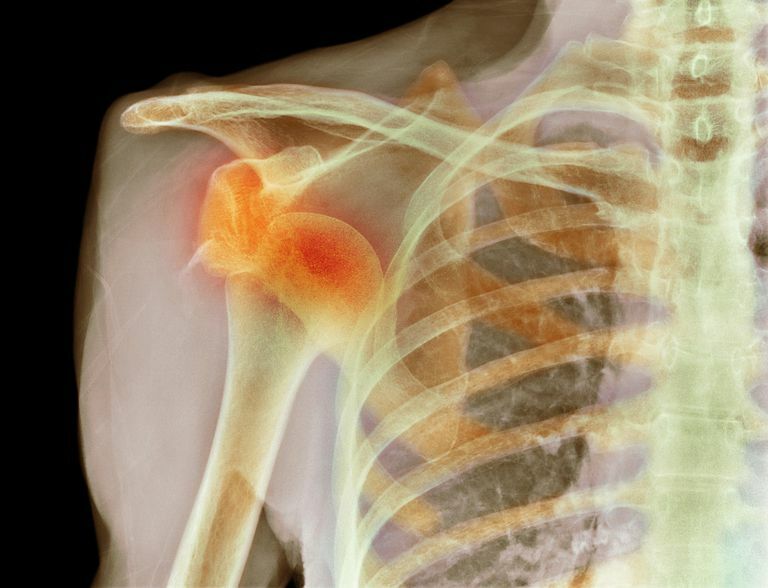 Shoulder dislocations typically occur from either traumatic injuries (falls, motor vehicle collisions, etc.) or from athletic injuries. Most shoulder dislocations occur when the ball comes out of the front of the shoulder—a so-called anterior shoulder dislocation. About 95% of shoulder dislocations are anterior dislocations. The shoulder can also dislocate out of the back of the shoulder, although this is a much more unusual injury. When the ball comes out of the back of the shoulder socket, the injury is called a posterior shoulder dislocation. Posterior dislocations are important to recognize as the treatment is slightly different, and unfortunately, these injuries can be easily overlooked. One of the reasons these injuries are missed is that the arm is held in a position that seems normal. Typically, the upper arm is held by the side, with the forearm held against the body. This is similar to the position you might hold your arm with a contusion type of injury, making the dislocation of the joint less obvious. Unlike anterior dislocations that occur after major injuries, the two most common causes of a posterior dislocation are seizures and electric shocks. The muscles that internally rotate the shoulder are much stronger than the muscles that externally rotate the shoulder. Because of this strength imbalance, sudden, forceful contractions—such as those experienced during a seizure or shock—can pull the ball out of the back of the shoulder. Typically after a traumatic injury such as a fall or sports injury, people are looking for the possibility of a shoulder dislocation. Conversely, when someone has a seizure or electric shock, most people aren't thinking about the possibility of a shoulder dislocation. Therefore, these injuries are sometimes overlooked because attention is on other aspects of the patient's health. In these cases, shoulder pain may be attributed to a contusion as a result of the seizure or shock. The most important initial step in the treatment of a posterior dislocation, once the injury is recognized, is to reposition the ball into the ball-and-socket shoulder joint. Repositioning the joint, called 'reducing' the +-joint, is typically not difficult, but much more easily tolerated with anesthesia to relieve pain and discomfort. Surgical treatment of the dislocation may be considered, especially when bone damage accompanies the dislocation. In the case of a posterior shoulder dislocation, it is common that when the shoulder comes out of joint, the ball forcefully strikes the edge of the socket. This can cause an impaction-type of fracture called a reverse Hill-Sachs defect. A Hill-Sachs defect is a common finding with an anterior dislocation. A similar injury, except on the opposite side of the ball and thus called a reverse Hill-Sachs, occurs with a posterior dislocation. There are also other injuries that can occur in association with posterior shoulder dislocations. These include fractures of the proximal humerus, tears of the labrum, and rotator cuff tears. In addition to treatment of the dislocation, it is important to ensure proper treatment of these associated injuries. As discussed, posterior dislocations are uncommon. The prognosis seems to be largely related to the amount of bone and cartilage damage that occurs at the time of the dislocation. Concerns for patients who have dislocated their shoulder include the possibility of recurrent (repeat) dislocations. Recurrent dislocations become especially problematic with larger bone defects as there is less stability to the shoulder if the bone is damaged. Rouleau DM, Hebert-Davies J, Robinson CM. "Acute Traumatic Posterior Shoulder Dislocation" J Am Acad Orthop Surg March 2014; 22:145-152. What Can Be Done if Your Shoulders Are too Loose?